How do the first supermarkets, a fabric weaver, and losing WWII create the Toyota Production System (TPS)? The Kaizen or Lean system of management has expanded beyond the Toyota Motor Corporation. TPS and Kaizen’s roots should not be singularly attributed to one person or one country. Although refined in Japan, the concepts of Kaizen stem from Western ideas and business practices along with Eastern precepts. The history of who was involved and where they found ideas presents an interesting global stage. Innovators such as Henry Ford, Deming, and Shewhart have strong influence in Kaizen along with Toyoda, Ohno, and Shingo. As the practice of Kaizen continues into new industries and countries, it’s philosophies and models become iterative and recontextualize practice and meaning. Kaizen is inherently innovative, and promotes continuous improvement. The system itself will certainly continue to transform enterprise, products, and services. The following paper outlines some of the history, people, methodologies, and events that have moved TPS across the globe. The depth and understanding of Kaizen goes farther and will continue to change. | a work by Devin Cabanilla © | ——————————————————– In 1890 a small textile company in Japan made a small improvement in the looms they used to make cloth. Sakichi Toyoda would begin to incrementally improve how their machines weaved fabric through the next 40 years (Toyota Industries, 2013). Eventually the small loom company would become the largest auto manufacturer in the modern era: Toyota Motor Corporation. The spirit of creating not better fabric, but the spirit of continuously improving a process is credited as being the forerunner to the system that Toyota uses. TPS as an innovative means has combined problem solving, human philosophy, process improvement, and innovative thinking methods (Liker & Hoseus, 2008). What Sakichi Toyoda began in 1890 grew beyond looms, but TPS success did not grow only by his direction. The Toyota Production System, and the Kaizen philosophy that it is built on, has been called Lean Manufacturing in the US. Many points of TPS have non-Japanese origins. The system is still revised and innovated with the collaboration of new industries, multiple global forces, players, and concepts. Ironically, Japan innovated and became successful in growing TPS by losing World War II in 1945. In this time, what was the Toyoda Loom Works had expanded to automobile manufacturing. 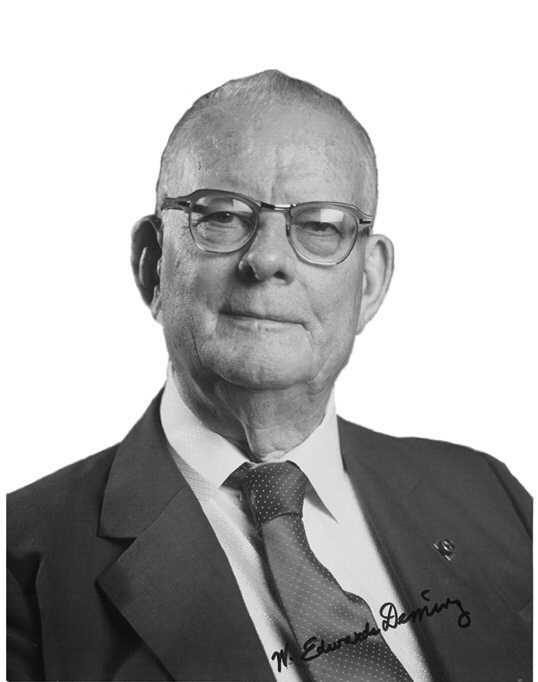 The injection of ideas from W. Edwards Deming and Training Within Industry practices (TWI) arrived to reconstruct post-war Japan based on a program developed by the US War Manpower Commission (Liker & Meier, 2007, p. 35). Ohno (1988) indicates that success at TPS and losing in WWII fragmented Japanese industry, even the Kaizen methodologies they began would not be accepted widely by Japan until the oil crisis of the 1970’s (p. xii). Toyota’s reconstruction period president, Toyoda Kiichiro eagerly assimilated US production practices while exclaiming, “Catch up with America in three years. Otherwise, the automobile industry of Japan will not survive” (Ohno, p. 3). Again in another paradox, the utilization of TWI in Japan would become standardized by Toyota, but ignored in the US post-war (TWI Institute, 2013). TWI became an essential tool to help employees maintain Kaizen activities and keep consistent organizational practices normative. It’s consistent practice of learning through seeing, doing, and acting were imperative; the application of standardized written instructions for all processes and practices made understanding and spreading information essential. Kaizen was able to maintain its circulation organizationally with Training Within Industry as a piece of the Toyota Production System. Another major component of TPS is the Just-In-Time (JIT) system. JIT is the alignment of being able to reach getting materials, manufacturing, and demand of products. This requires constant improvements and accumulated change. The core of Kaizen is continual good changes made by everyone within an organization (Imai, 2013). Bodek (1988) credits the addition of JIT into Toyota’s manufacturing to Taiichi Ohno who studied Henry Ford’s production line and their manner of removing non-valuable waste (p. ix – x). Additionally, part of the direct history of Ohno are his travels to General Motors and other factories during the 1950’s. Another strange history to developing JIT and TPS was Ohno visiting an American supermarket for the first time in 1956. A supermarket provided customers with what they wanted, when they wanted it; an essential piece of JIT (Ohno, 1988, p. 23) Taiichi Ohno summarizes the simplicity of JIT by indicating “All we are doing is looking at the time line… the moment the customer give us an order to the point when we collect cash. And (sic) we are reducing that time line by removing the non-value-added wastes” (Bodek, 1988, p. x). Eventually, he will move beyond learnings from Ford and US industries. Making something more efficient by using time better seems extremely simplistic. The more difficult portion that Ohno introduced to TPS was the complete analysis of wastes within the production line. Ohno (1988) emphasizes that “true efficiency improvement when we produce zero waste and bring … work to 100 percent” (p. 19). Within this idea of a real truth hidden behind useless processes are Ohno’s categories of waste. He identifies wastes as: overproduction, waiting, transportation, processing itself, inventory, movement, and defective products (Ohno, p. 19-20). The work that is conducted may seem necessary or valuable to managers or workers involved in a process, but not so when the constraints of that work are analyzed under a lens of waste analysis. Still, the application of JIT cannot occur until waste elimination starts. Kaizen is the base of removing these wasted little by little; after this occurs then really using TPS can begin (p. 20). Although TPS has functional outcomes in mechanical modes, the application of the system occurs in layers. Figure 1: Two Models of Toyota Way (Liker & Hoseus, 2008, p. xxvii). The additional piece of TPS hidden within the shadows of process improvement and the mechanics is it’s human component paired with Kaizen intent. It was not until 1991 that Toyota Motors President Fujio Cho and Chief Officer Hiroyoshi Yoshiki began to model the structure of what TPS is and its unstated rationales (Liker & Hoseus, 2008, p. 14). Toyota considers “Respect for People” a fundamental pillar in the structure of TPS. As much as Kaizen may be transferred to the US as Lean Manufacturing, the intangible concept of valuing people as much as the machine methods or results is forgotten during implementation of kaizen production systems in new enterprises. Fittingly, Liker & Hoseus (2008) point out to observers “…the lean tools and processes are subordinate to helping people identify and solve problems and continuously develop” (p. xxix). It is the end goal of any enterprise to fulfill the needs of some person. Unfortunately, this consideration of people as a valued TPS tenet is also still considered innovative when it should be the norm. The Toyota Production System as an innovative force cannot be attributed to one person. There is no single method or component that encapsulates it. Models increasingly add complexity and more meaning in TPS. Respect for People as a concept developed into it’s own structure called the Toyota Human System (Liker & Meier, 2007, p. 24-26). TPS has more aspects to the stated elements of TWI, waste analysis, Kaizen, and JIT. There are extra ideas including: the visual system kanban; the observation practice of genchi genbutsu; the automation concept jidoka; the innovation method PDCA and more (Ohno, 1988). There is also no singular innovator like Henry Ford or Thomas Edison as a driving force in TPS. The Toyoda family did not shape Toyota Motors intrinsically. It was the managers, theorists, and practitioners working in the field who constructed TPS collectively through time and opportunity. 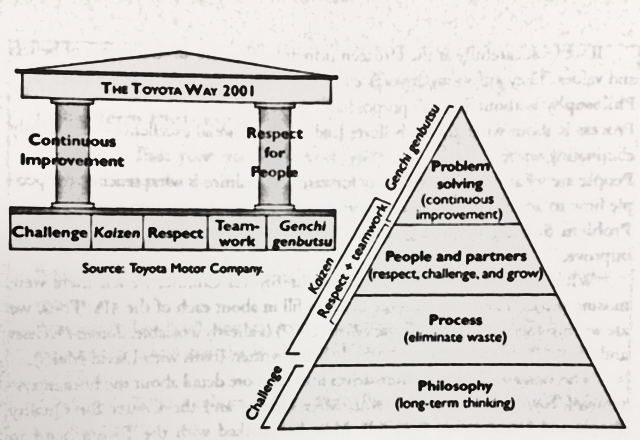 The Toyota Production System is an inherently iterative organism that has transformed from cloth to machine, from technique to philosophy, and from engines to human dignity. This entry was posted in kaizen, lean, toyota production system, Uncategorized and tagged continuous improvement, devin cabanilla, history, international business, international relations, kaizen, lean, toyota production system. Bookmark the permalink.